A plume of gas and particles is ejected some 100 kilometers (about 60 miles) above the surface of Jupiter's volcanic moon Io in this color image, recently taken by NASA¹s Galileo spacecraft. The plume is erupting from near the location of a plume first observed by the Voyager spacecraft in 1979 and named Masubi. However, during the course of the Galileo tour of Jupiter and its moons, a plume has appeared at different locations within the Masubi region. 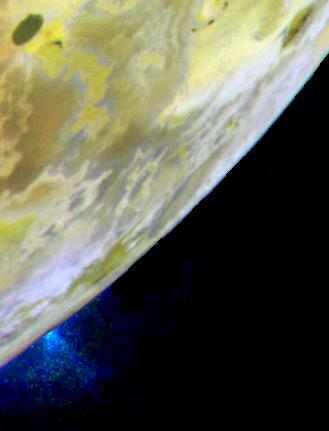 This color image is the same as the previously released false color mosaic of Io, but with special processing to enhance the visibility of the plume. The plume appears blue because of the way small particles in the plume scatter light. North is to the top of the picture, and the Sun illuminates the surface from almost directly behind the spacecraft. The resolution is 1.3 kilometers (0.8 miles) per picture element. 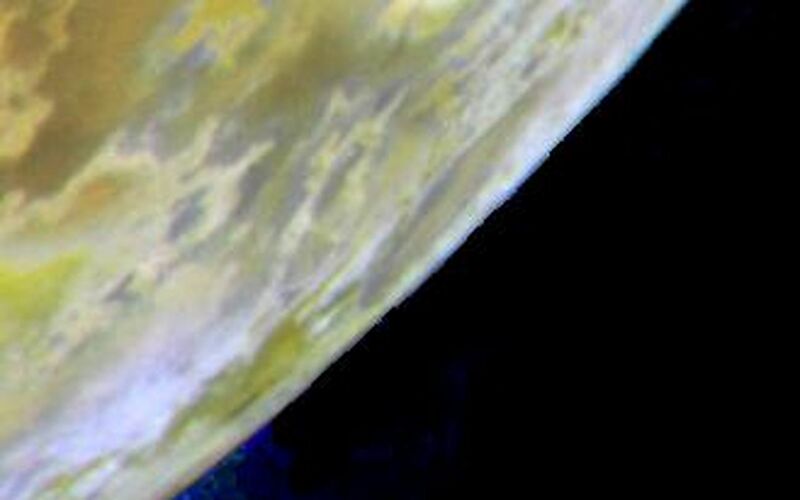 The images were taken on July 3, 1999 at a distance of about 130,000 kilometers (81,000 miles) by the Galileo¹s camera. The two images on the left are actually the same image displayed indifferent ways. In the top-left image, the Masubi plume is too dim to be seen. The bottom-left image has been processed to enhance the visibility of the plume, which can be seen rising above the bottom-left edge of Io's disk. 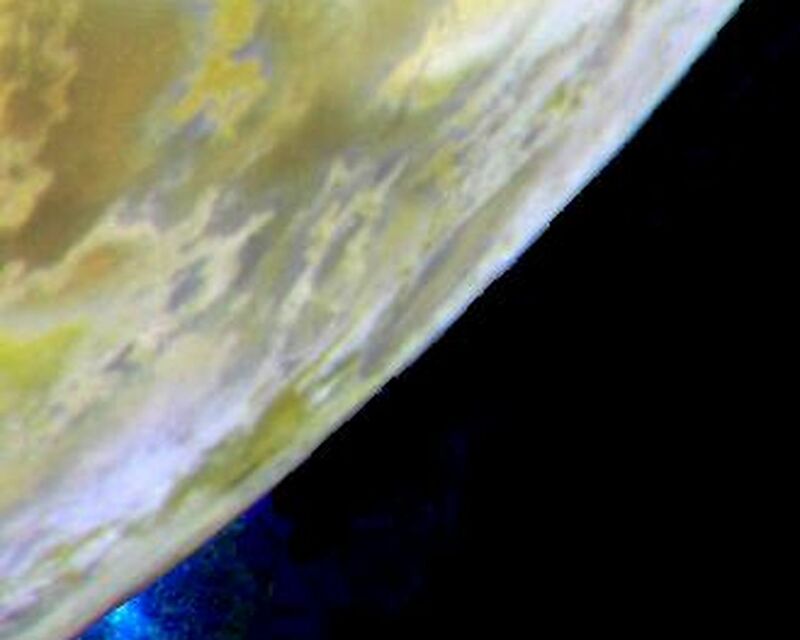 This processing overexposes the surface of Io so it appears completely white. 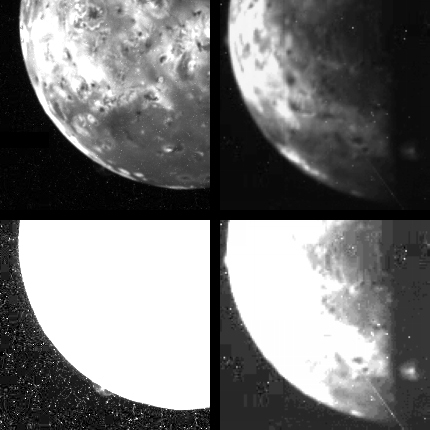 In the pair of images on the right, a second image has been processed in similar fashion, so that Io's surface features are visible in the top-right image and are overexposed in the bottom-right image. 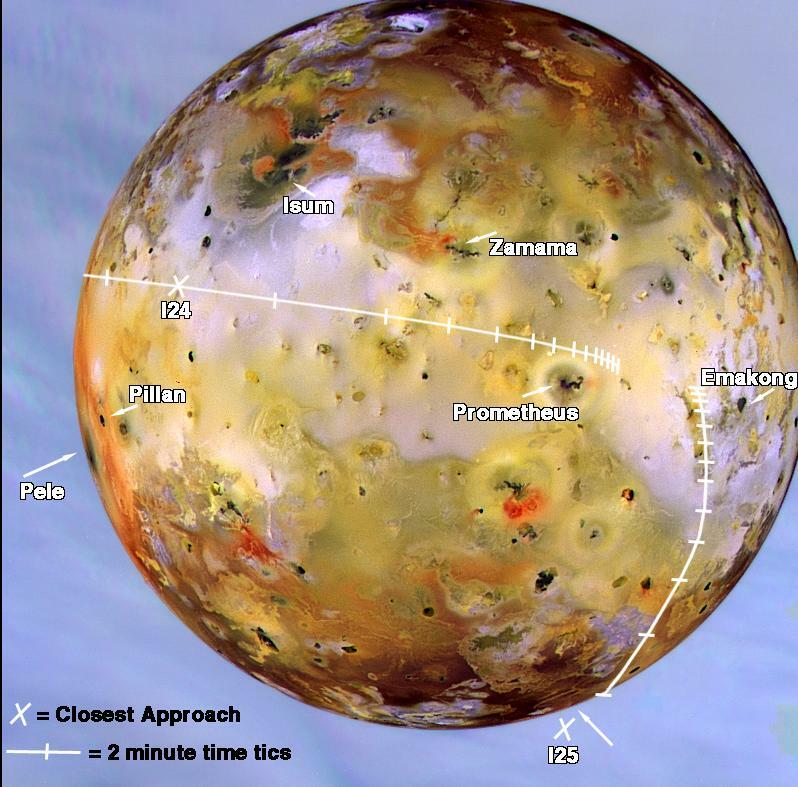 This time Masubi is on the night side of Io, just beyond the terminator (the imaginary line separating day from night), but the plume is high enough that it extends up into the sunlight. 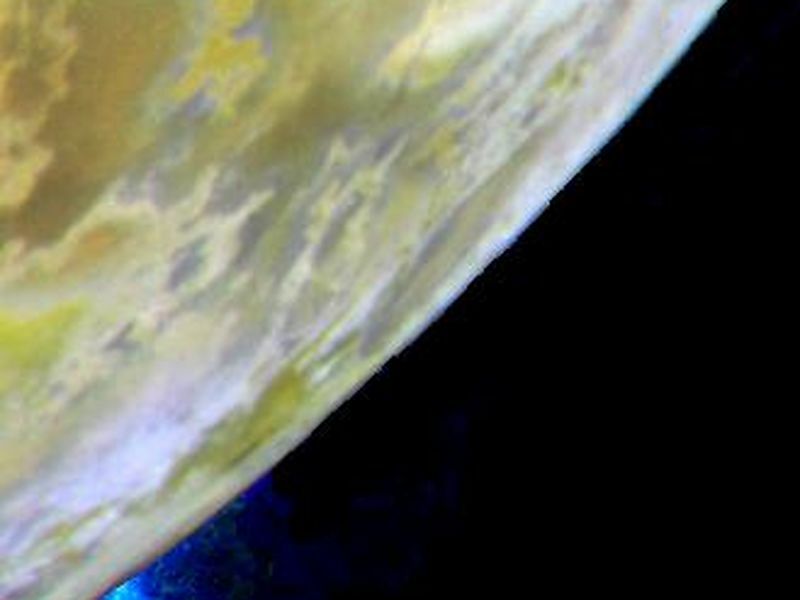 A plume from the volcano Prometheus can also be seen in this image, rising above the left edge of Io's disk. The diagonal line in the bottom-right image and the small bright spots sprinkled across all the images are caused by charged particles hitting the camera's CCD (charge-coupled device) detector. North is to the top in all the images. The images on the left were taken by the on August 14, 1999 at a range of 1.1 million kilometers (700,000 miles) and have a resolution of 11 kilometers (7 miles) per picture element. The sun illuminates the surface from behind the spacecraft. The images on the right were taken on August 14, 1999 at a range of 1.6 million kilometers (1 million miles) and have a resolution of 16 kilometers (10 miles) per picture element. The sun illuminates the surface from the left. Galileo's flight plan for I24 & I25. The Jet Propulsion Laboratory, Pasadena, CA manages the Galileo mission for NASA's Office of Space Science, Washington, DC. JPL is a division of the California Institute of Technology, Pasadena, CA. This image and other images and data received from Galileo are posted on the World Wide Web, on the Galileo mission home page at http://solarsystem.nasa.gov/galileo/. Background information and educational context for the images can be found at http://www.jpl.nasa.gov/galileo/sepo. Sensitive to Jupiters stratospheric temperatures, these infrared images were recorded by the Subaru Telescope on the summit of Mauna Kea, Hawaii. Areas that are more yellow and red indicate the hotter regions. Scientists used red, blue and yellow to infuse this infrared image of Jupiters atmosphere, which was recorded by the Subaru Telescope on the summit of Mauna Kea, Hawaii on Jan. 12, 2017. A cyclonic storm in Jupiters northern hemisphere is captured in this image from NASAs Juno spacecraft.